Over the next few blog posts, I’ll discuss how my spinal surgery is affecting my competitive mentality, how I’m setting goals, staying motivated, and dealing with potential setbacks. However, before I do that I feel like I need to establish a baseline or a history of my life to set the stage for the story to come. A lot of people in my current life don’t know much about my past and the tumultuous events of 2012. The current view shows me, living with my supportive boyfriend of 4 years, and a well adjusted child who splits his time between my house and his dad’s. In early 2012 I had just done quite well running an off-road snowmobile trail marathon and was training for my first ultra-running event when I began having foot issues. I had taken up running as a way to combat other health problems on the horizon and lose 50 lbs, so being told I couldn’t run was devastating. It came at a time when my entire life felt like it was unraveling. And so, I tell you this story. It starts from the beginning, the early beginning, my childhood. It’s a transcript of a speech I gave in mid-2012 with a few minor edits made for consistency and clarity. At first glance, people who meet me have no idea of my past. It’s dark and ugly and tumultuous — I hide it well. I’m here to tell you how I channeled the bad times into something unexpectedly better. So bear with me – my story is dark at times but hopefully ultimately uplifting. I grew up in a medium sized town in Iowa, with a dad who worked a blue collar job and a mom who didn’t work for much of my childhood. I was the “only” child until I was over six years old, which in my opinion shaped my psyche and personality quite a bit. Only children are known for being perfectionists, people who possess lofty goals for achievement, and who enjoy attention but yet are sensitive to criticism. This description fits me to a “T”. When my younger two brothers were born in quick succession, I felt betrayed – who the heck are THESE TWO?! And why are they here? I had already become used to my solo life and had a difficult time adjusting to the addition of two boisterous, noisy, pesky little brothers. They had each other and grew up very close. During this time, the storm clouds were brewing on the horizon. It was close to this time that my mom’s struggles with chemical additions and mental illness began affecting daily family life. Probably in an effort to protect us from bad news, we kids didn’t hear anything about what was actually going on – things were brushed under the rug and never spoken about again. I was young and didn’t understand the shifts of mood in the house – I just knew my household was “different” and I kept this to myself. My brothers and I became excellent at pretending to be “normal” and “okay”. It became our forte and is now second nature for all of us. As I entered the early teen years, I became more of a ‘mom’ to my younger brothers. I also began understanding what was happening based on bits and pieces of arguments overheard, voices echoing through the ductwork late at night and disturbing our sleep. At this time, I decided it was my job to protect them, care for them, and shelter them in whatever ways I could. This is a huge burden to bear for a young girl who is just trying to learn about the world herself. I have a vivid memory of taking my youngest brother to a friend’s house late one evening during a particularly violent fight. He was 12 and could no longer bear to hear the screaming in the household and didn’t understand what was going on. When we got to my friend’s house, he settled down and proceeded to devour an entire sleeve of Thin Mints on my friend’s couch and fell asleep. The content look on his face was worth the inconvenience of ruining my night out. Also in my teen years, I found my own support system in my high school boyfriend. He was my high school sweetheart who would later become my husband. I sought what comfort and solace from him and his family that I could, and they took me in with open arms. When I went to college I suffered “emotional whiplash”. I finally had no one to take care of but ME. Suddenly, feelings and thoughts I had repressed for years came bubbling back to the surface. I had neglected taking care of myself and my emotional needs, and so spent the next few years on and off various antidepressants and in and out of therapy. Through this process, one of my professors put me in touch with a relative whose mother had similar issues as mine. The woman sent me a lovely card during our exchange, and the cover spoke to me. 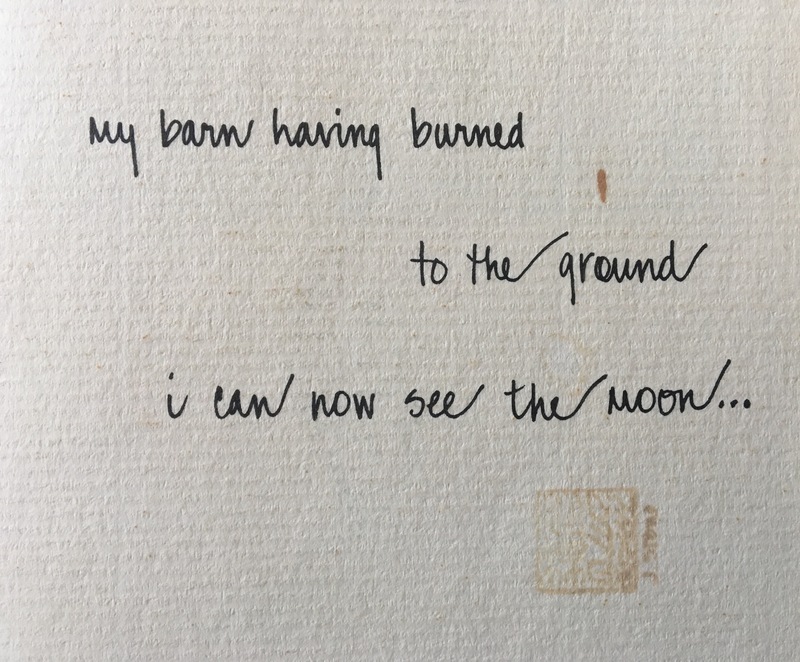 It said — “My Barn Having Burned to the Ground, I Can Now See the Moon”. I have kept this card close to me for the decade that has since passed as a reminder of walking through the fire, so to speak, and surviving. My parents eventually got divorced when I was in early college. Through this period of tremendous pain and growth, I gained great self awareness, learning how to respect myself and discovering self esteem. My mom was in and out of treatment for her issues, but it wasn’t enough – the abuse continued. It was difficult, but I cut off communication with my mother at this time. It seemed ‘cold’ to others – but it was a big step in healing. Through this I learned it is of utmost importance to protect myself and honor my needs first. This epiphany would serve me well in more difficult times to come. In the interim years, I did everything one is “supposed” to do upon growing up. I got a real job, got married, and had a baby. However, I was deeply unhappy with my life once again despite “having it all”. I began the difficult process of self examination – WHY was I unhappy – and going through the painful process of shedding comfortable but ultimately ill fitting things – I quit my job and came to my current company, discovered my passion and undying love for my young son, and also found an outlet in running long distances. I finally learned how to act like ME and not the version that I thought others wanted or expected of me. Earlier this spring, one of my favorite things was temporarily taken away from me – running. I was diagnosed with a severe stress fracture and haven’t run more than a mile in almost four months. This is in sharp contrast to the 40-45 miles per week I was running earlier, and is significant because through running I found a way to quiet down my mind. It was meditative, to focus on the rhythmic thumping of my steps hour after hour, while I ran through the woods and let my mind skip and wander and think about everything and nothing at all. Slowly and systematically changing pieces of my life and surviving led, in a way, to the biggest decision I’ve EVER made. My husband and I hadn’t been happy in our relationship for years but were both too scared to admit it. We finally we got up the courage to have the difficult late night conversations, and both of us looked deep inside ourselves and admitted that we were no longer the ‘right fit’ for each other, and that staying together was worse than living apart. And so last month, my divorce was finalized. We figured out that, while he is a wonderful father to our son and a great person, he was just not the person for me. And so now I am a newly single mom with a broken foot and other newly diagnosed health issues, taking care of 1 large house, 1 preschooler, 1 dog, and me … alone. However, I have faith that good times and a newfound strength will come out of this – the history of my life has shown that it always does when I am subjected to extremely difficult circumstances and use the pain as a catalyst for change in my life. So I focus on the good portions of my life right now – I have great friends who are supporting me unconditionally, an ex husband who continues to clean my house every week and take care of the yard, and a wonderful and intelligent son who brightens my life immensely. I have no idea where I’m headed or where I’ll end up. I am now much less scared of great change and the associated pain, because I have seen over and over again that sometimes, stepping out into the unknown with purpose brings you the best things in your life, and happiness you neither expected nor thought you deserved. An excellent job of writing and I hope the best for you in your recovery. I’m a longtime online friend of your Dads so I know you have some wonderful support. Thank you sir, I appreciate it. How is your cycling going this year? Are you finding some mojo, even if it’s not the same mojo as 2016? Kudos to you for dealing with those childhood wounds so you can be the best mom to your son. I can relate to so much of what you share. It’s the deep, dark, gross stuff I’ve been working on this year in hopes that I (we) can stop holding myself back from reaching my full potential. Both my husband and I were born to teenage moms. I was the only child for four years, him for eleven (I think). Competitive, perfectionists, sensitive to criticism and rejection – uh, yup! It didn’t help that my mother used my fear of criticism to control me until I was in my 30s. My mother is a pill popper and my husband’s mom is a hoarder, among other issues. My husband’s mother has never been in our home (of nearly 15 years) because she refuses to respect my rules and boundaries. My mother is negative, controlling, manipulative and lacks boundaries. She crossed the line back in 2010ish and when I confronted her, she turned the whole family against me. It’s not a happy situation, and like you mention, other people say it’s “cold,” but the health of me and my husbands family comes first – ALWAYS! Would you say that woman you met in college changed the trajectory of your life? For us, it was our grandmothers. We were both our maternal grandmother’s favorite (among many others – big Catholic families)! We always thought it was because we were awesome, then a couple years ago it occurred to me that they were probably filling the role that our mothers were unable to. Unfortunately, they died when we were pretty young, but their love was a glimmer of hope. I think most of us go down the path of doing what we think we’re “supposed” to do. I know I did and was miserable for many years. The difference is that not many people find the courage to change. That must have been incredibly scary deciding to get a divorce, but it seems like you’re happier for it. I love your attitude about looking forward to the good things that will come from pain! I look forward to following your journey. Best wishes for healing – physically and emotionally!